sycamore stirrings: The *real* crafter in the family. . . The *real* crafter in the family. . .
Is turning out to be my oldest. When she gets an idea, that's it. She's doing it and not stopping until it's finished. That's how this set of Cinderella stuffies came about. I had some squares left over from her class hand print quilt and let the girls have at them with fabric markers. She started with her usual fairy picture, then decided it was Cinderella's Fairy Godmother, and then requested more fabric to make the rest of the characters from the story. Such a great idea, right? And all hers. Gotta tell ya, I'm lovin' the wicked step-mother. 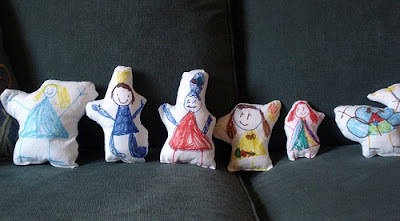 To make the fabric easy for the girls to draw on, I back it with freezer paper. You can buy it in the grocery store (in The States, anyway.) After the pictures are finished, peel off the freezer paper. I cut the pictures out leaving a pretty large margin around them (well, as large as I can.) 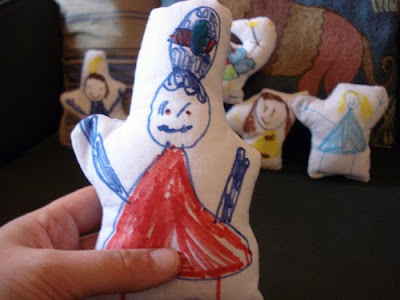 Lastly, sew, stuff (my oldest did the stuffing) and you're finished. I know, I know this was supposed to be a post about Italy, but I had to break into real time for a moment. Don't worry, you'll get your Italy. It's all set to go. Have a relaxing Sunday. You do have a crafter in the family! I love those stuffies a bunch! These are totally cute - love them. Brilliant project!!! Have a good week! these are fantastic, she did a great job! These look brilliant, well done to your daughter! and freezer paper is fab stuff. it's not that widely available here in th UK but on ebay (A bit expensive there) and can be found in quilt shops so worth giving local places a call to check if they stock it. So cute!!! Thanks for the tip on the freezer paper. Madison has a sewing machine as her top item on her christmas list, which makes mommy very happy! Love these! 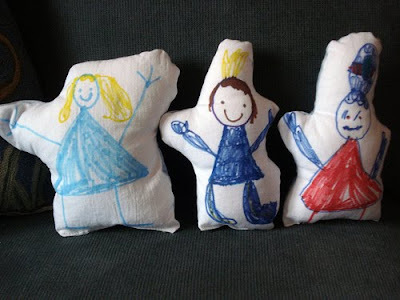 And thanks for the tip on freezer paper...thinking these might be a fun way to make ornaments for gifts this year. OMG, those are amazing! I wish I had some of my own! I've been doing this kind of thing too, but hadn't used the freezer paper trick - genius! Thanks for sharing! Bet your daughter could come up with a great scene! This would be a great activity for my young students! they could do a self-portrait and then we could stuff them and hanh them on the door!. These are darling!